Of the 4,050 firearms traded in for gift cards, there were 55 assault weapons and 3,335 handguns, along with 660 replicas, according to the Office of Police News Affairs. During the first half hour of the gun buyback program this morning, 1335 weapons were turned in, officials said. The department offered up to $100 for weapons handed over. :( … 3390 firearms gone just like that. Well at least Chicago will be a utopia now, free of violence. Someone even turned in inert hand grenades and cause a huge shitstorm with the bomb squad. I wonder if they got $100 each for them? That would be a pretty sweet profit if they were the usual cheap gunshow ones. 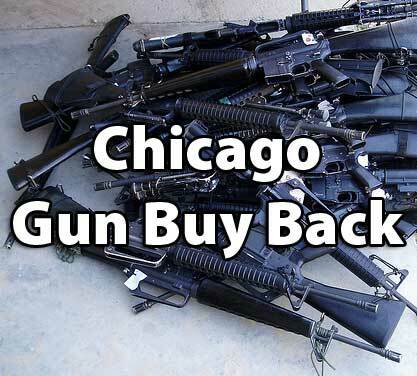 They annihilated last years total of 1900 guns, which mayor Daley mentioned in his ABC interview a couple of days ago. Anyone who turns in an assault weapon, a gun or a BB gun at any of the 22 designated locations will receive a prepaid MasterCard — $100 for an assault weapon, $75 for a gun and $10 for a BB gun, an air gun or a replica gun. The guns will be destroyed. Is there a law against face to face transfers of non NFA weapons in Chicago? :P Someone could clean up if they offered people in line a bit more for their guns. So 1900 guns turned in equals 1900 shootings that were prevented? :roll: Maybe lots more incidents of gun violence were prevented, or maybe none… why bother making up such a statistic. Also, why would the gun only last another 50-60 years?